Just yesterday (December 5), the autopsy for Linkin Park frontman Chester Bennington was finally released. Now, however, more disturbing details are emerging concerning the late singer, who reportedly tried to take his own life nine months before he eventually hanged himself. 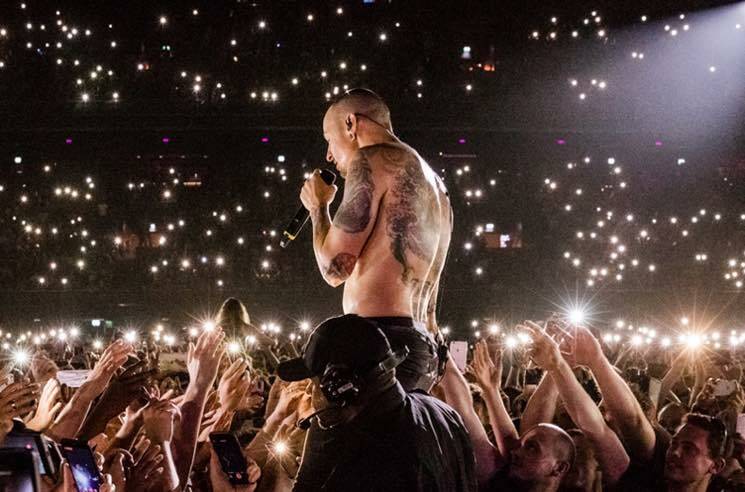 According to a new report from TMZ, Bennington tried to kill himself in November 2016 — nine months before he was found dead on July 20, 2017. You can learn more details of the supposed suicide attempt here at TMZ. Be warned, however, that the details are graphic. According to TMZ's sources, Bennington's widow Talinda gave this information of the previous suicide attempt to the coroner's office for its investigation. However, her lawyer asked the information be redacted from the officially released autopsy report. Assistant chief coroner Ed Winter told TMZ, "The report stands as is," and he would not comment further. As previously reported, the official autopsy and toxicology results showed that Bennington had alcohol and MDMA in his system at the time of his passing. Authorities found a prescription bottle of Zolpidem (Ambien) on his dresser, along with a pint glass of Corona and an empty bottle of Stella Artois.